There have been a couple of Marvin Miller cards produced in recent years notably in the 2005 Topps All-Time Fan Favorites set. Curt Flood never played a game for the Philadelphia Phillies. This wasn't because he wrecked his knee in spring training or got cut before he made the team. This was not because he was a Big Time draftee that couldn't hit a curve or a pitcher who's arm hit the wall and ran out of bullets. It was because Flood was of the opinion that he could not be discarded by the St Louis Cardinals to another franchise without his permission. And Marvin Miller agreed with him. Great Photos aren't just pictures, there beautiful works of art which tell stories that stretch their physical borders. Similiarly there are a few baseball cards that live in a different stratosphere. Most of these are Star Cards of at extreme values. There are a few others that may be considered commons, but have details that raise them to this Star level. The cartoon on the cards reverse revals that Flood is an accomplished artist. It is almost a clue that Curt Flood is a creative person that may think a little differently and is the kind of a guy that may challenge the system. Just another cool detail about Curt Flood's 1970 Topps card. It is true that Marvin Miller did a lot more for baseball and baseball players then getting Curt Flood out of Philadelpha and kickstarting the Players Union. But for me he will always be tied to Curt Flood - The Philadelphia Phillies are a footnote in the story and the 1970 Topps #360 Curt Flood tells a lot of that story in 9 square inches. Dayf over at Cardboard Junkie has a post collecting Marvin Miller Tributes here. Finally for more on the 1970 Topps #360 Curt Flood card check in with our favorite 1960s Topps Authority Jim from Dowingingtown at his 1970 Topps Blog. I am so depressed about Carlos Ruiz getting the hook for violating the MLB PED policy. 2012 was a tough season all around for Philies fans. Somewhere in that darkness Carlos Ruiz emerged as a rock while the 2012 campaign was crumbling. Now the good feelings of Ruiz's breakout season have turned into a rotten apple that induces one to want to vomit. I am going thru the process of putting together 2013 Phungo Cards right now. Each year Ruiz is one of the first cards I make. There are several reasons for this. He was always sort of an under the radar player. He's a catcher so he is in tons of shots. He is a little guy - love rooting for the Davids in sports. And near as I can tell prior to today, I always thought of him as a pretty decent guy. The Pix on this Phungo card was taken during a Phils 9-3 victory over the Giants in August of 2010. #Chooch had a double 2 RBIs and a pair of run scored. He caught one of the first games pitched by Roy Oswalt as a Phillies Pitcher. Two months later the same Phillies team would lose to the same Giants team in the NLCS. For more info on the game on 8/17/2010 click here. First and foremost Carlos Ruiz is the one responsible for his misuse of whatever he was taking, but I want to blame everyone else. Charlie Manuel - To be honest Charlie's record speaks for itself - He is a good manager with a World Series and NLCS crown under his belt. My #1 Beef w/ Charlie is a lot different then other folks. I firmly believe that Manuel sticks with his vets way too much. Carlos Ruiz is not a big man and he is playing the most grueling position on the diamond. He has had increasing games every season from 2009-2011. This would have continued in 2012. Manuel rarely takes the opportunity to use his stars in the DH role whenever the opportunity is presented in interleague play. I realize there are issues with DHing a Catcher but it can be done. Ruiz needs more days off. Manuel need to honor this. Ruben Amaro Jr - Amaro is responsible for putting together the roster. I honestly don't really believe in blowing a lot of money on your 2 catcher, but Brian Schneider hit so poorly that it put Manuel in the position where he had to start Carlos Ruiz everyday. Chase Utley - At the beginning of 2012 the Phils were really short on offense with both Chase Utley and Ryan Howard being out of the lineup. I am not sure where the communication broke down but Utley seemed to think he would be ready for the 2012 season - he was not. 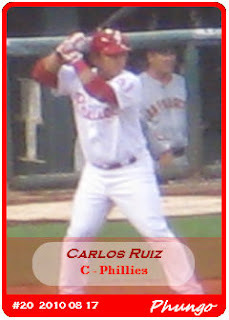 Carlos Ruiz was stuck with carrying the offense early in the 2012 season and did a remarkable job. Now we find out that he was taking Aderall. I have likely that bottled up since it became clear the Phillies season was going south way back June, feels good to put pen to paper. cmon spring training. Labels: #Chooch, Carlos Ruiz, Chooch, PED, Phillies, Phillies 2012 Season, Phungo Cards, Suspension, UGH. Today there is a Poppel produced Show in Oaks PA. It is at the Arnolds Family Fun Center. Arnolds is the place behind the Target comples which houses the Go-Kart Track. It is near the Expo center where CSA used to produce some larger shows. The Poppel shows are a good local show. There small with only a handful of dealers but those dealers have an interesting mix of things. Typically good for an afternoon thumbing through dime boxes with some oddball items, perhaps some good vintage. I think the 35 tables is a bit of an overestimate on their part. Their shows are about a dozen dealers. Night Owl is in the process of sifting thru some BWG stories - currently he is doing non-baseball which likely will consist of the Buffalo Bills and Hockey players. In that spirit I will pass along one of my encounters. During the summer of 2000 I think - I was involved in a summer shore house rental in Sea Isle City NJ. One of the bars we frequented (I think it was called the Carousel) was a friendly outdoor deck with great drinks service and fun patrons. 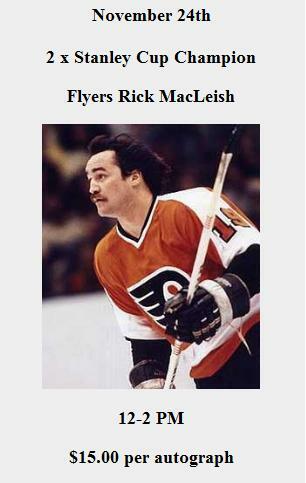 One of the regular customers was Rick MacLeish. I can't remember a single conversation we had beyond saying hello - but I remember always enjoying the fact he was there. Additional signers today including NFL vets Tom Woodeschick and Lou Michaels. I plan on hitting the show for a few hours around noon. Say Hi - I am the good looking guy with the Red Phungo Binder of checklists. I can't think of a better way to spend Small Business Saturday then supporting some curmudgeonly old card dealers. For additional info on Philadelphia area card shows click here. The story is known well - Mike Piazza was picked by the Dodgers in the 62nd round as a favor to Tommy LaSorda who was childhood friend of Mike Piazza's father. The pick was the 390th of the 1988 draft. A few weeks ago Mike Piazza was inducted into the Philadelphia Sports Hall of Fame. He never played for the Phillies, but athletes from the Philadelphia area are also considered for the Local Hall. This winter Piazza will be on the ballot for induction into the National Baseball Hall of Fame for the first time. There are many first times on the 2013 ballot with impressive credentials, but questionable issues both on and off the field - Clemens, Bonds, Schilling Sammy Sosa. Piazza's name and steroids have been linked a few times - The BBWAA voters will need to figure out what that information means to them. Piazza's career numbers are very impressive and for me are hall worthy. 427 Homers, 1335 RBIs, 2127 Hits and a .308 BA from a guy who was primarily a catcher. 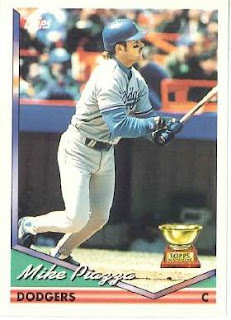 He was Rookie of the Year in 1993 and finished 2nd in the MVP voting twice (1996 - Ken Caminiti, 1997 - Larry Walker). He was a 12 time all-star and took home 10 Silver Slugger awards. Piazza does not have a World Series Ring, but he was part of 5 playoff runs for 3 different teams (Dodgers, Mets, and oh yeah the Padres). As a member of the 2000 Mets Piazza played in the Subway Series versus the Yankees and Roger Clemens. Perhaps because it falls in the years between and UbiquiBlogging this set doesn't appear to come up often. Regardless, I think it is pretty decent looking and could use further observation. The photos are interesting - an off center home plate border focuses attention to the image without being too showy. The team name and player name are both listed in a minimalist yet clear fashion. It is from last years that Topps did NOT use foil on their base cards (there is a parallel set - topps gold - that has foiled player names). It's a simple design that complements that helps feature the photo - Does a card design need to be any more? I am not sure where I picked up this 1994 Piazza card but suspect it came out of a dime box. There is a rookie cup on this card, but it is not Piazza's rookie card - It his his first Topps Solo card - he appeared on a 1993 Topps Rookie Catchers card that also includes Carlos Delgado. Above is a card of Jamie Moyer from the innaugural Phungo set of 2009. This past weekend Moyer turned 50. This past season he made headlines for several starts he made with the Colorado Rockies in which age related records were broken. Unfortunatley time caught up with Jamie Moyer in 2012 and he was released. I have not seen an official announcement of Moyer's retirement, and maybe we won't get one. I hope he gets another shot. Moyer is the only player to pitch in the 2012 season that is older then I am. For whatever reason as long as there is somebody out there playing baseball that is older then me, it helps me feel younger - and I like being able to hold onto that feeling. David Price and RA Dickey were just announced as this years Cy Young Award winners. Tonight I would like to take a look back at a Phillies pitcher that won the award several times. 2012 marks the 40th anniversary of Steve Carlton winning the award for his 1972 campaign in which he recorded 27 of the Philllies 59 wins. It was the first of four Cy Young awards for Carlton. I am sure the 1972 Topps Carlton Card is a favorite of many Phillies fans. It represents one of the best trades in Phillies history. Rick Wise for Steve Carlton. Wise was a very competent pitcher, but no one knew at the time of the trade that Carlton would go on to put up a Hall of Fame numbers. This card is from my childhood collection which explains the rough but acceptable condition. I likely inherited this card from an older kids collection or acquired the it via trade. For purposes of this column I have added the 72 Topps Carlton Traded Card to the FTC analysis below. The card is a High number and trends in the $5-$10 range. Phungo has been running variations of Hall of Fame Profile since our inception. I have intended to revisit the For the Collector (FTC) portion of the posts to see what happens regarding card pricing for the different players. Time has finally passed and today we are going to look at the FTC for Steve Carlton. Basically we found that the pricing of Steve Carlton cards has gone down. However there appears to be some Hi-End cards available in this 2012 survey that were not sold in our 2010 sample. I look forward to seeing how these numbers look in a few more years. The potential Blue Jays Marlins trade appears pretty lopsided for the immediate future - but maybe not. Check out the Home and Away splits for the Marlins top 2 pitchers. Also worth Noting that Josh Johsnon had declining pitching WAR numbers the last 2 seasons after posting 6+ WAR in 2009 and 2010. Buehrle has had Declining WAR last 3 seasons and declining IPs last four seasons. I realize that I am one of the few people that is interested in the World Baseball Classic. I admit that the event has it's issues and it inteferes greatly with the MLB season, however I don't think the the WBC is entirely without merit. My mom was born and raised in Thalland, I have been fortunate to visit there several times - most recently in 2007. I am very excited to see that Thailand will be part of the 2013 WBC, even if it is only in next weeks Qualifying round. Thailand's bracket is hosted by China-Taipei (Taiwan) - who I would think is a strong favorite to win the pool. Regardless, Baseball is a funny game - in a smal round robin tourney One strong pitching performance coupled with an error or somebody crushing a hainging curve can significantly alter the outcome. Last month while Team Phungo was on the road word got out that Johnny Damon will play for Thailand in the WBC. I am sure most folks responded with a shrug and/or "What the hell is Damon's connection to Thailand?". Like myself Damon's mother is of Thai heritage but he grew up in here in the states. Beyond that we have very few similiarites - He is a Major League Baseball player, I blog about Baseball Cards. He can grow a full beard in an afternoon, that would take me a decade. I found out about Damon's Thai connection relatively recently. Fortunately I have always enjoyed him as a player (except when the Yankees beat the Phils in 2009) and have built a small collection of his cards. He is a good player who appeared on the national stage frequently with the BoSox and Yankees. He is an engaging personality, I hope he and the rest of the Thai team have some success in the WBC - The game will grow in Thailand and maybe someday there will be a true Thai ballplayer in the majors. If I read the WBC schedule correctly Thailand and Damon will play their opening game on Wednesday November 14th. It appears the MLB Network will be carrying games either on TV or On-Line. Stay Tuned. We will have significantly more coverage of the WBC than reader interest. Zach over at Autograph Cards recently mentioned that he had Autographs representing every MLB team that has existed since 1952 except the Boston Braves. This got me thinking that there can't be that many Boston Braves that are still living. According to baseball-fever the number of living Boston Braves alums is around 20. One of those 20 players is Gene Conley who also played a few seasons with the Phillies. I have been wanting to feature Conley in a column for a while. I never knew who Conley was till I returned to collecting about 5 years ago. I have always been interested in 2 sport players and quickly found out he was one when I started collecing 1950s era cards. In addition to being a Major League Pitcher the 6'8" Conley was also an NBA player. He was a member of three Boston Celtics NBA championship teams from 1959-1961 - His teammates would have included Bill Russell. He was also a member of the 1957 Milwaukee Braves who won the World Series. His Teamates with the Braves would have included Hank Aaron, Warren Spahn, and Eddie Mathews. The card featured above from the 1959 Topps set and is a common. Commons from the 1959 Topps set in acceptable condition can be found for 50 cents at card shows. This is what this Conley card went for - slight crease in upper right corner, but otherwise in good condition. It will cost you $2 to get the card off ebay. Gene Conley's Topps RC is #215 in the 1953 set. The recent Lo-Bay price is $4.39 with an Ungraded Hi of $30.95 There was a PSA graded card NM-MT 8 (off-center) that went for $50. COMC has an off-condtion Conley RC lsited at $4.75. I didn't look hard but there does not appear as if Bowman issued a Gene Conley card. I also did not find any vintage cards of Conley as a Member of the Boston Celtcis. As far as Certifed Autos from major card makers, Conley is contracted with Tristar-Obak and has a couple of fine looking signatures in the 2009 set. There are two of the Obak autos that have finished recently one at $21.99 and the other $32, The cards were serialed to 50 and 25 respectively. If certified autos aren't your thing this link contains some vague TTM information - Conley appears to sign for $5 via check, but based off of other articles I read I am not sure the address is current. This Facebook Page has some really cool pix of items from Conley's career. It appears to have been started by a fan, but it looks like a Conley family member may have addes some photos. With the 2012 season in the books and I would like to take a look at the handful of baseball players that have roots in my hometown. I grew up in a small town in south central Pennsylvania.. As far as I know nobody from my high school had ever emerged to the professional level for a team sport prior to my tenure there. That has changed relatively recently. In 2012 there were at least four players from my School in baseball's professional ranks. 1 in Korea, 2 in the minors, and 1 at the major league level. Today I would like to embark on a mini series looking at the 2012 season of NHS grads. First up is Anthony Lerew, who we have looked at a few times in the past here at Phungo. Lerew has spent the last several years on the edge of the Majors after a few years as a mid-level prospect in the Braves organization. 2012 found Lerew pitching in Korea for the Kia Tigers. I don't know any Korean so there is some guess work involved here, but if I have my columns correct Lerew had an 11-13 season and pitched to an ERA of 3.83. He logged just over 170 innnings in 32 starts. The Tigers play in the Korean Baseball Organization, in 2012 they appear to have compiled a 62-65-6 record (I am assuming six ties - looks like all teams schedule 133 games). This placed them 5th in the 8 team KBO. Lerew last saw major league action stateside in 2010 as a member of the Kansas City Royals. His sole MLB victory came as a member of the Royals at the expense of the Chicago White Sox in 2010. Lerew outdueled Mark Buehrle giving up 3 hits and 1 run (HR Carlos Quentin) over 6 innings. Additional career highlights would include striking out future Hall of Famer Ivan Rodriguez and likely HoF Alex Rodriquez. One final highlight is a no-hitter which Lerew tossed in the Venezuelan League. There are a couple of mall card shows in my area this weekend. Poppel.com is producing a show at Granite Run Mall on Route 1 just outside Media PA this weekend. The show will feature lots of Eagles Alums signing autographs plus a few other football Players including Denver Brocons Hall of Famer Floyd Little. Among the Eagles featured are Wes Hopkins, Claude Humphrey and Jeremiah Trotter. The Flyers Gary Dornhoefer will also be present. Hit the Poppell link above for times and pricing. This show is Sat and Sun only. Looking down the road a few weeks Poppel has Flyers Great John LeClair scheduled to sign autographs on 11/30. Just up the road from Granite Run at the Plymouth Metting Mall S&B will also be hosting a show. No signers at this show. Both of these shows are small, but typically large enough to have something of interest for most collectors. Good for killing a few hours in dime boxes anyway. Saturday November 3rd is also customer appreciation day at Carls Cards in Oakmont. Hollis Thomas formerly of the Eagles will be on hand to sign FREE autographs. On December 7th Carl's will also be hosting John LeClair. The Hunt Auctions produced PhillyShow will be December 7-9. The signers includes a bunch of Phillies. Hall of Famers listed include Steve Carlton, Dave Winfield, Dennis Eckersley, and Frank Robinson. At one point I believe there was a CSA show scheduled for the Expo Center in Oaks for 11/10 but that show appears to no longer be happening. It has been over 3 weeks since the last team Phungo posting. Fortunately it was not due to any sort of problem, health issue or other unforeseen event. Team Phungo was on Vacation! Today we make our triumphant return and it isn't even a baseball or baseball card posting. But this is a sports posting - sort of. I have been doing the MLB stadium tour and knocking out about one a year. Among the stadiums I have visited are the historical cathedrals of Wrigley and Fenway. Neither of those classic venues comes close to comparing in age to the one presented above. The Colosseum is a fairly iconic landmark, but I really didn't know that much about it prior to visiting - The sports-nut in me did get a bit of a chill when I realized that I was standing in basically one of the oldest sports facilities on earth. The Colosseum Wikipedia page has a lot history and information and is worth perusing if your interested in delving deeper. We spent a just over 2 weeks touring Italy includuing Rome Florence and various outposts on the Amalfi coast - while we did experience some minor issues that one may run into related to travelling in a foreign country, we had a thoroughly enjoyable trip. Historical sights, beautiful cities, and works of nature. We had several great meals, experimenting with new foods and discovering great italian wines and beers. A nice bonus was excluding a day we got absolutely drenched outside the colosseum (day prior to photo above) we had two weeks of absolutely perfect weather. My wife is much more of a traveller then I am, and I appreciate her drive to push me to enjoy new things and places. We will not be able to take trips of this magnitude very often, but I am glad we could this time. More and more I feel Phungo is expanding beyond baseball cards and baseball. I remain a huge baseball fan (despite being gone for the bulk of the postseason) and will continue to post game reports and musing on baseball cards. Not sure where that ride will take us, but hope some folks will stick around for the journey.